Aboard the President, we’ve trained our expert butlers to a particularly high standard and with an eye for detail. We know that first impressions are important, which is why your butler will welcome you with a drink in the Piano Lounge. From here, your butler will walk you through your itinerary for the rest of your stay and will make a note of any dietary or allergy requirements. Following this, your butler will show you to your room, explain the luxury features of the room, and answer any queries you may have. Your personal butler will be there to guide you every step of the way, with one eye on the clock to make sure you know every option available to you. At 14:15 on your first day, your butler will show you to the reception for excursions, and after dinner, they will inform you of your itinerary for the next day. Your butler is trained to the highest possible standard, and remains constantly vigilant of your timetable, so all you have to do is relax and enjoy yourself. Armed with an in-depth knowledge of your likes, dislikes, and dietary requirements, your butler will be both a well-oiled machine and a charming personal assistant. From the initial meet, your butler is prepared with an arsenal of drinks and food at the ready for you, from a light breakfast to lunch, and afternoon tea to dinner. All you’ll need to do is inform your butler of your preferred dining time and where you would like to eat, the rest is taken care of. Aboard the President, we make sure that you’ll never have to lift a finger, with your personal butler doing all the heavy lifting for you. Upon arrival, your butler will relieve you of your luggage, and then bring it back to the car following your departure. You may believe that your butler is something like a well-accustomed waiter, or a perfectly in-sync planner, but at President Cruises, we make sure that all of our staff are trained to the highest standard. That’s why, when our butler consults you on your drinking choice, you know that their knowledge is coming from experience, skill, and education. You can trust that, when asking your butler for recommendations on dining, entertaining or simply relaxing, you’ll be getting advice you can really trust. When you leave the President, don’t be surprised if you feel that you’ve grown somewhat attached to your butler. At President Cruises, our butlers take genuine pleasure in providing you with the finest service, ensuring every element of your trip is the best it can be. Our butlers take great pride in their work and rightly so. They are the individuals that you’ll see the most on your trip, your Sherpa of the cruise, so they – and we – want to make sure you have the best time possible. 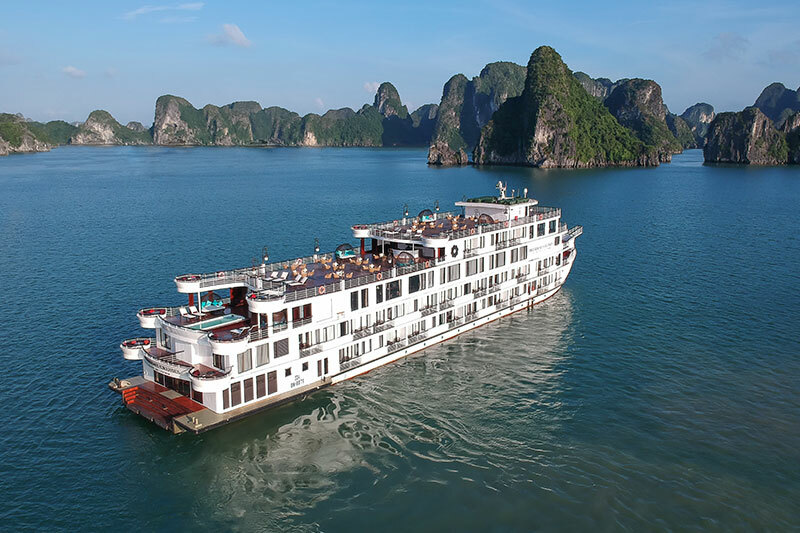 Where are the Largest Cabins in Halong Bay? 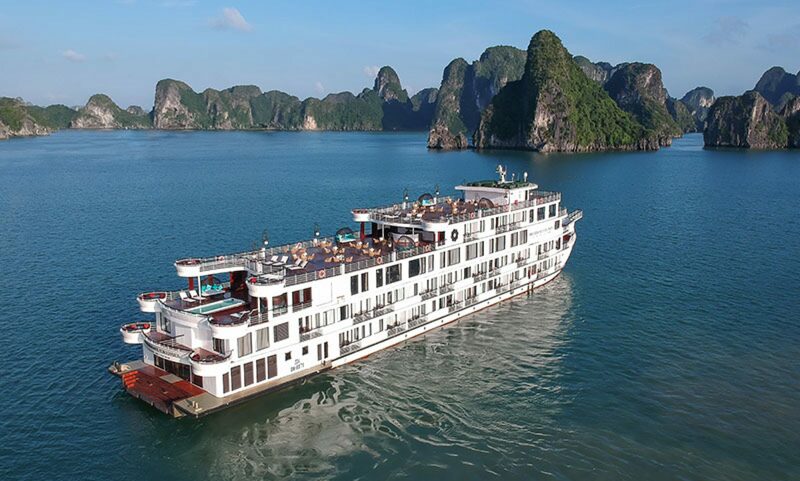 President Cruises, Halong Bay’s newest and largest cruise ship has arrived to boldly glide through the bay’s waters. The President is not only the newest and most glamorous floating hotel in the bay, it also offers the largest cabins of any cruise ship. 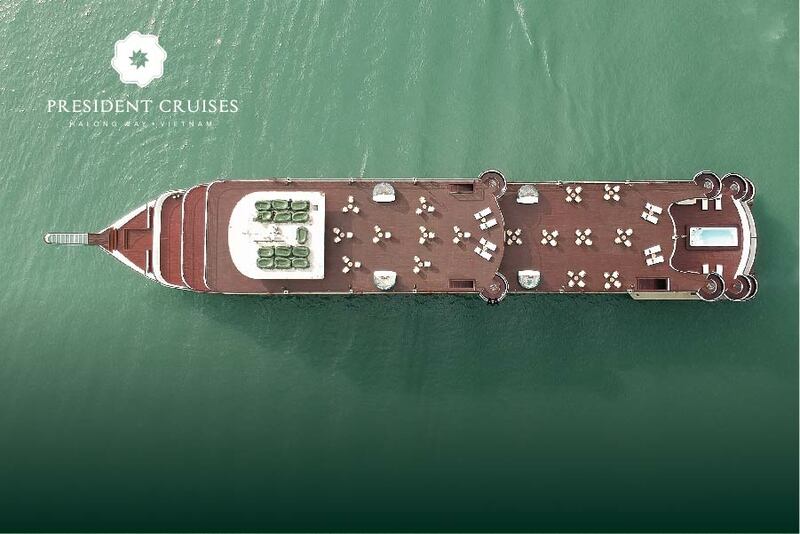 The choice of five luxury cabin types await you aboard the President, each one demonstrating the sheer opulence of this sumptuous ship, ranging from a generous 30sqm to an expansive 90sqm. Each cabin comes with a private balcony or terrace and broad floor-to-ceiling windows, allowing for a majestic view of the tranquil scenery. All rooms are adorned with complimentary tones; parquet wooden flooring and a walk-in closet. They’re also transferable between double and twin. The 18 Ambassador Balcony cabins and 23 Premier Balcony cabins are 30sqm and come supplied with every modern indulgence you might desire. They also enjoy a private balcony for a more personal view of this picturesque seascape. The two Cabinet Suites and two Treasury Suites provide ample room to unwind in their respective 35sqm and 38sqm. With an indulgent bathtub to relax and unwind in, you can float by the limestone karsts in a deep sense of serenity. The President Suite boasts the highest point of opulence in the bay, measuring a total of 90sqm with additional space for the capacious private terrace. 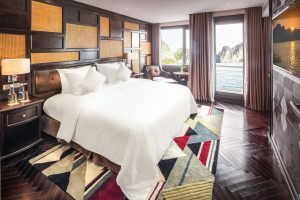 Sitting at the front of the ship, the President Suite leads the way through Halong Bay’s waters, with the private terrace allowing for the finest view from any cruise ship. 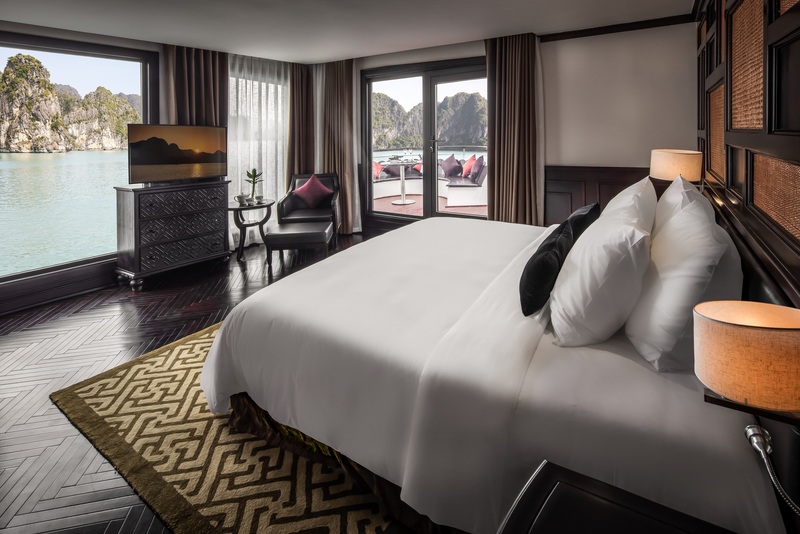 The President Suite is the penthouse on the sea, with a private open-air Jacuzzi, private bar and dining area, and floor-to-celling windows that promise an incomparable Halong Bay experience. If you’re looking for privacy but you don’t want to sacrifice comfort, President Cruises is the first choice for any sophisticated world traveler.